Motorola Buys Home Networker 4Home: Does It Make Sense? What is the secret formula for home networking? Motorola Mobility, the communications subsidiary of Motorola, said today it is buying home networking specialist 4Home in the latest -- and likely not the last -- acquisition in smart grid. 4Home's star attraction is ControlPoint, the company's software that can tap the power consumption of various appliances and deliver information to consumers about their power usage and prospective power bills. 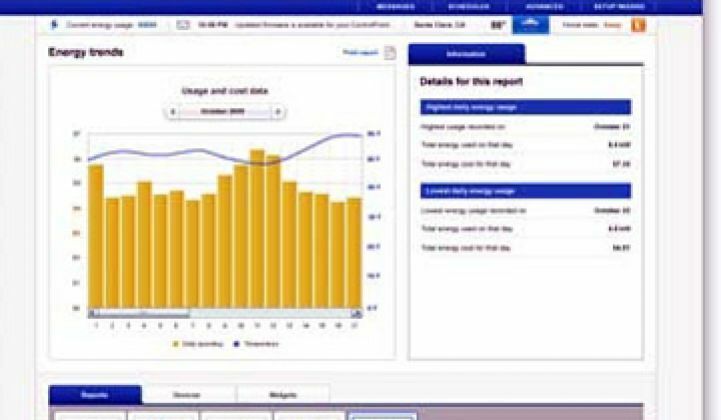 Consumers can likewise use the software (with a little extra hardware) to turn down lights, curb air conditioners and other actions to save power. To date, the company has largely been trying to get to the market through big-box retailers and utilities. Its biggest allies to date have been Sensus, Marvell Semiconductor and Verizon. In all likelihood, Motorola will integrate 4Home's software into its phones, set-top boxes and home networking equipment. The big question now is how Motorola and/or its competitors can make money off of the smart home. Many executives already fear that consumers will recoil at spending money, or spending much of it, for energy management services. As a result, most are trying to come up with ways that will allow them to cull revenue while allowing consumers to get home management services for free or at a discount. General Electric, Samsung and LG Electronics could have it easy in this regard. These companies can get into home networking by inserting intelligence into large appliances. They will likely try to sell home networking equipment and services, but if they can wring extra dollars out of consumers with dynamic air conditioners or refrigerators with off-peak defrosting cycles, success in smart homes can be declared. Microsoft hopes to use Hohm, its home energy software, as as an advertising portal for retrofitters, plumbers and energy services companies. Considering that most consumers only retrofit every several years, that could be a tough sell. Best Buy hopes to sell installation services. Unlike utilities or communications carriers, Best Buy doesn't have a customer churn or peak power problem to solve. Thus, Best Buy may face stiff resistance from the cheapskates of the world. People Power, a startup being fostered by Gene Wang, hopes to sell software and components to equipment makers at a low, low price. Adding its intelligence into a product, ideally, will only increase the bill of materials by $5. Motorola might simply try to embed intelligence into its home equipment. Because set-top boxes don't carry the same high price tag as a new refrigerator, it could become difficult to hide the additional costs. Motorola will also get browbeat by the true consumers of home networking equipment -- communications carriers and utilities -- over any additional costs. Similarly, the company could adopt an EcoFactor strategy. EcoFactor, however, offers a software-as-a-service approach. Motorola primarily makes things. It could take a little gear shifting and partner massaging at the big M to act as a software-as-a-service provider. Cisco, another big maker of set-top boxes and home networking equipment, is in a similar situation. On the other hand, hundreds of millions of intelligent set-top boxes will get shipped over the next decade: even if home networking becomes a hardware play, the dollars from those boxes will add up. Two years from now, we might know which of these models truly is the secret formula.